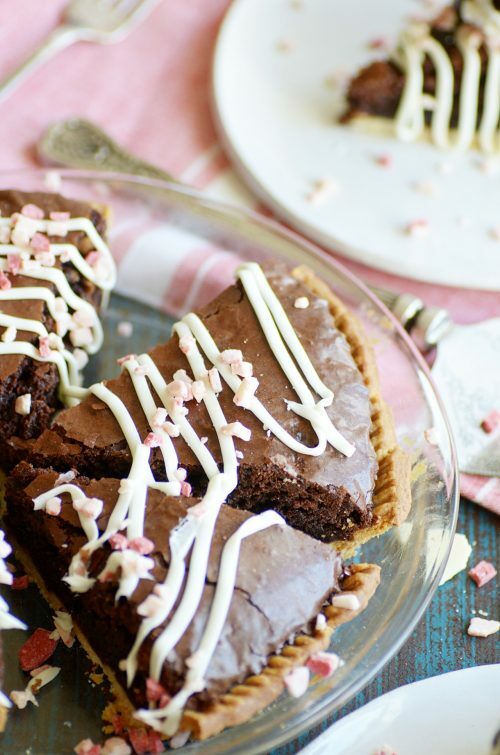 A fudgy peppermint brownie pie topped with white frosting and candy cane bits. I know Thanksgiving usually gets all the credit for being the best season for pie. But I think it’s high time we gave the rest of the holiday season a little time in the pie spotlight! Move over pumpkin, pecan, and apple… there’s a new pie in town. 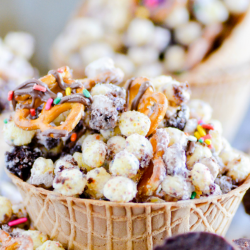 And it’s about to turn your Christmas dessert plans upside down! 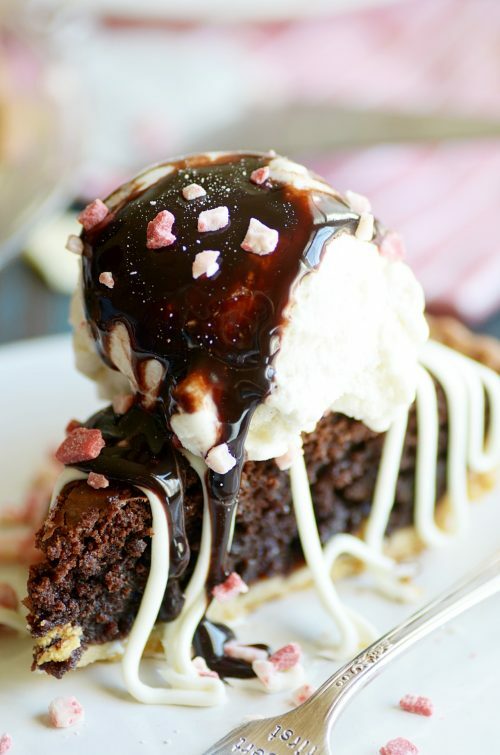 Rich, fudgy brownies baked inside a butter, flaky pie crust topped with cream cheese frosting and peppermint candy bits. Ok, so maybe it’s not so easy on the waistline. But it’s extremely easy to make!! That balances things out in some strange alternate universe, right? Right. For starters, I already had a homemade pie crust ready made in the fridge from a previous recipe post I had already photographed and written. So there’s that. But just know that you can totally use a refrigerated pie crust here to save you some time. Next (as you may have guesssed already), I used a box brownie mix! Oh yes I did. Ghirardelli mixes are my absolute favorite. They are rich and fudgy and completely indulgent. Absolutely perfect for this pie. Of course if you want to go the homemade route when it comes to brownies– be my guest! 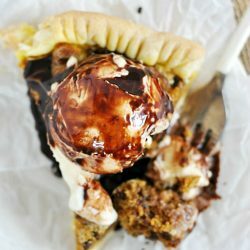 On top of this oh-so-delicious brownie pie, I drizzled a cream cheese frosting. On the night I had to whip this up in a pinch for unexpected guests, I used a store-bought cream cheese frosting I had on hand. It was delicious, and I don’t think anybody knew the difference. But if I can add a little tidbit of advice? When it comes to cream cheese frosting, homemade really is better. I’m a total advocate for store-bought frosting, I really am. And it’s one of my go-to ingredients for making desserts by the seat of my pants. But when it comes to cream cheese frosting, if you have the time, take an extra few minutes to make it from scratch. I’m giving you my favorite recipe for that too, never you fear! Drizzle some of my favorite homemade cream cheese frosting on top of this decadent pie, and you’ll think you’ve died and gone to heaven. Believe me! 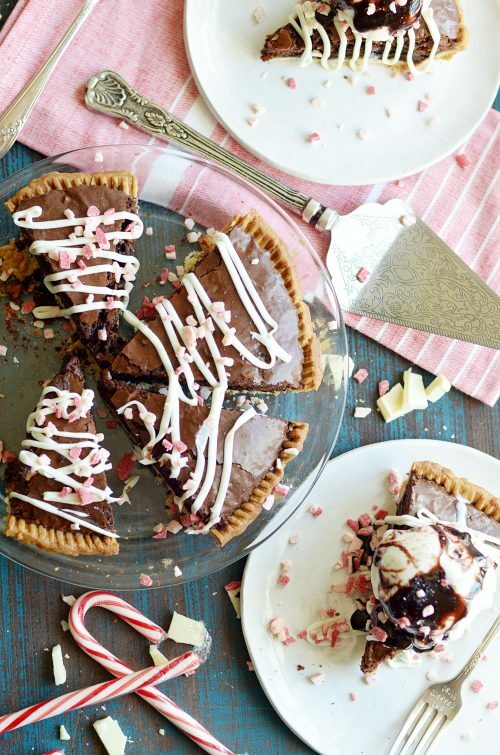 Let’s not forget the star ingredient in this pie: the peppermint candy bits! I don’t actually use peppermint candy when I include peppermint in a dessert. Why? Because I’d like to keep my teeth, thank you very much. Instead, I always use my favorite peppermint go-to ingredient: Andes Peppermint Crunch Baking Chips. Instead of crunched up candy canes and peppermints, this nifty ingredient is peppermint flavored white chocolate! So besides being super practical, it’s really yummy too. I would eat peppermint white chocolate over a candy cane any day! Enjoy this pie with hot cocoa or a glass of cold milk and lots of friends, family, love, and cheer! Happy holiday eating season, my friends. 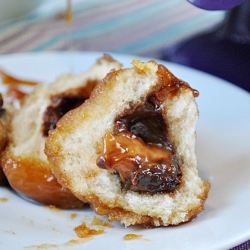 I am sharing this recipe in partnership with eBay. CLICK HERE to view the full recipe in my eBay post.